With hundreds of millions of people living only miles away from global coastlines where earthquakes and tsunamis occur in higher frequency or even in tandem, the need for more versatile architecture becomes more prominent. Additionally, with the rise of nuclear reactor plants located in many of these same geographic locations, in the case of hazardous radioactive leakage due to unexpected natural disaster-based destruction, bunker material able to prevent the transmission of high-energy ionizing radiation is similarly in need. Although currently there a many options designers have in constructing safe-houses to resist earthquakes and tsunamis individually, there are no structures currently able to withstand the contrasting forces brought upon by both disasters. To add, with radiation shields almost exclusively being used for space exploration, the creation of cheaper, yet effective, radiation-resistant layered material to protect against possible radiatiocative contamination from damaged nuclear plants can help to save many from catastrophe. These three seemingly unrelated disasters in actuality are rather connected. For example, in March 2011, in Japan, a 9.0 magnitude tsunami-earthquake heavily damaged not only the buildings capable of withstanding high magnitude earthquakes, but also the Fukushima Daiichi Nuclear Power Plant, which led to thousands of deaths due to radiation exposure. Because this combined disaster has the potential of affecting such a large percentage of the worldwide population, I became inspired to research and ultimately built a working, scaled-down tsunami-earthquake resistant structure along with an inexpensive computational layered system effective in preventing the transfer of ionizing radioactive particles. Can I construct a shock-isolating system able to rapidly stabilize buildings from the forces of both earthquakes and tsunamis at least comparable to isolators used solely for earthquake damage prevention? Can I computationally create cheaper yet effective layered radiation shield in comparison to the European Space Agency’s model SHIELDOSE to allow radiation protection material to become more applicable to safehouse bunkers and even common homes and buildings? Can I produce a surface structure design that minimizes architectural weakness and can provide refuge to people during earthquakes, tsunamis, radiation exposure, or a highly possible combination of all three. Lastly, would I be able to accurately test these models under appropriate conditions/environments? Because of how related earthquakes, tsunamis, and radiation leakage can be, by answering these problems, and with there being more pressure buildup in the Earth’s tectonic plates, any one or more of these disasters can affect millions across the world. Especially because of current inadequate systems in place to provide safety during these disasters in-part or as a whole, it becomes crucial to find such a solution. Therefore, I wanted to propose a unique solution with multiple parts that all aid in heavily reducing damage to buildings and the people within it. More on this is to come! Almost monthly, high-causing extensive damage to buildings while taking thousands of lives. Occasionally, the seismic activity that creates earthquakes will cause crustal movement on the ocean floor that can result in a tsunami. With such a disaster, lack of power, roadblocks, and general panic can lead more people unable to evacuate efficiently, making local safe-houses integral to the safety of thousands in danger at a time. Specifically with earthquakes, civil architect Merrill W. Baird designed a seismically-retrofitted building using his unique combined vibration control solution of a high damping rubber bearing (a bearing composed of alternating thin steel and high durometer rubber sheets) as a foundation for a building to create an earthquake-resistant structure. Major earthquake forces applicable: Tensional/Compressional/Shear stress with the ground breaking apart and moving either in opposite directions or toward each other in stiff horizontal juts. Additionally, varying-magnitude aftershocks can damage buildings with base isolation systems equipped for only a range of magnitudes. Additionally, with tsunami protection, the most popular current method is the use of concrete flood-protecting and force absorbing sea walls on coastlines. However, with higher magnitude earthquakes producing subsequent tsunami waves, these sea walls proved to be insufficient not only in Tohoku in 2011 but in Haiti in 2010 and in Indonesia in October 2018. Major tsunami forces applicable: hydrostatic pressure within foundation with tsunami-based flooding, shear force and surge in/after tsunami initial bluntly hits the structure, and a combined hydrodynamic force in regard to the effect to water essentially ripping or wearing-down base isolators from their original rubber-steel layers. Types of ionizing (electron-removing) radiation. Without going too deep, each of these particles has a specific frequency and energy that relate to its speed and its ability in ionizing atoms. The energy of each particle determines its behavior when interacting with a surface. For example, to protect against high-frequency neutron emissions, materials of lower atomic number (such as lithium and hydrogen) would carry enough potential energy equal or greater than that of the emitted neutron to allow for ionization. Alpha/beta particles and X-rays usually cannot carry enough energy to pass through highly dense materials. Contrastly, gamma rays can ionize atoms of lead and bismuth hundreds if not thousands of times before the energy being completely absorbed in the system. Computations utilized a software, SPENVIS, which accurately compared photon behavior to the Boltzmann Transport Equation and PSTAR databases. Therefore, all results displayed accurate simulations of photon behavior, monoenergetic energy, particle angular distribution onto model, and subparticle dissipation. This system comprises of two bearings: an outer laminated (more flexible) rubber bearing (LRB) and an inner (less flexible) high damping rubber bearing (HDRB). Covering the LRB is an EPDM water-resistant membrane, and both the LRB and HDRB have 18 alternating steel and rubber layers. Lastly, the bearings are connected on each inner hexagonal side with 4 shock transferring rubber springs The reasoning behind this setup is that the axial force absorption in the central HDRB significantly increases with increased work (higher magnitude earthquakes) placed into the system but decreases with decreased work (lower magnitude earthquakes) placed into the system. By this, the system is able to “self-stabilize” shock based on the initial force put into the system. This occurs in due to the shock transferring rubber springs which can simply direct the required amount of force either toward the HDRB or LRB, therefore making the energy transfer more efficient and rapid. In comparison, conventional base isolators can only resist horizontal juts in a threshold of magnitudes and cannot self-stabilize based on changing magnitude earthquakes. This structure was designed in a hexagonal box shape with a central pyramid. The hexagonal shape allowed for a conservation of materials and a more efficient transmission of energy in comparison to cylindrical design. The edges of the model are more supported by the pyramidal skeleton and each facing side models the same pattern as the base isolator to stabilize the surface structure to a greater degree. This model was tested at the Arizona State University Civil Engineering Laboratory with a shake table that simulated an approximately 1g direct shearing and a 50x scaled-down version of the 2011 Tohoku earthquake (scaled magnitudes ranging from 0.1 to 9.0 on the Richter scale). The differences in g-force acceleration between the surface structure and the base isolator were collected over a period of 6 seconds. Then, the model was transferred to the Oregon State University O.H. Hinsdale Wave Laboratory where it was tested against 13 waves ranging from 5-50 cm in height and 83-249 cm from the shoreline. Additionally, each test was completed with either a panel or angle side orientation to the shoreline. Other then any signs of damage like dents on the surface structure and hydrodynamic force checked with moisture detectors (for the base), the displacement of the model from its original position was recorded in order to find the most efficient location on a shoreline to place a safe-house and at what orientation toward the ocean. The frequency used in the test is 20 Hz and the amplitude of the wave is 1mm with a real frequency of 20/50=0.4Hz so the corresponding period is 1/0.4Hz=2.5s. Since the structure usually is a long-period response, the period of the structure usually is around 3s-5s. As shown below, in the first 0.5 seconds, the orange sine wave peaks decrease from around 0.75 g to 0.6g, which supports this model's capability in self-stabilization from constant horizontal juts shown in the blue graph. Original time = 300 seconds with a g-force of 500 g, so the scaled version would be a 6 second, 1 g peak gravitational acceleration. 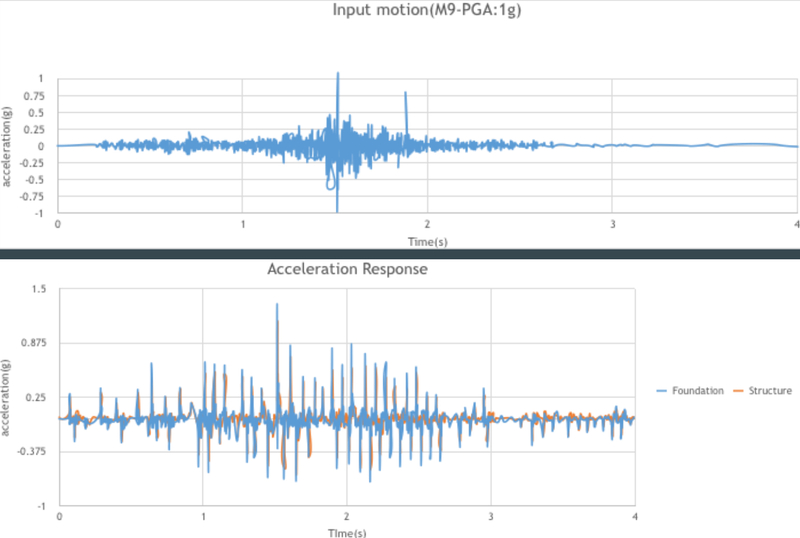 The top graph shows the input motion and the second graph shows the acceleration response of the surface structure and base isolator separately. As shown, with increased g-force put onto the system, the resulting response of the base isolation system is exactly 1g and the response of the surface structure is less than 0.4g showing a close to 60% decrease in transfered energy, which is comparable to current base isolation systems that can obtain only a 40% decrease in g-force accceleration. Furthermore, because the model resisted the shocks of the most powerful shakes, it can be concluded that all of the aftershocks would be resisted. The first set of tests were conducted with the prototype located 83cm (322 ft) from the shoreline facing the wave as a panel side. At wave heights of 5 cm (15 ft), 10cm (30ft), and 20cm (60ft), the model did not move. At a wave height of 30cm (90ft), the model moved 13 cm (39 ft). At a wave height of 40 cm (120 ft), the model moved 51cm (153 ft). At a wave height of 50 cm (150 ft), the model moved 88cm (264 ft). The next set had the same organization but at 166 cm from the shoreline, and the last set was 249 cm from the shoreline. 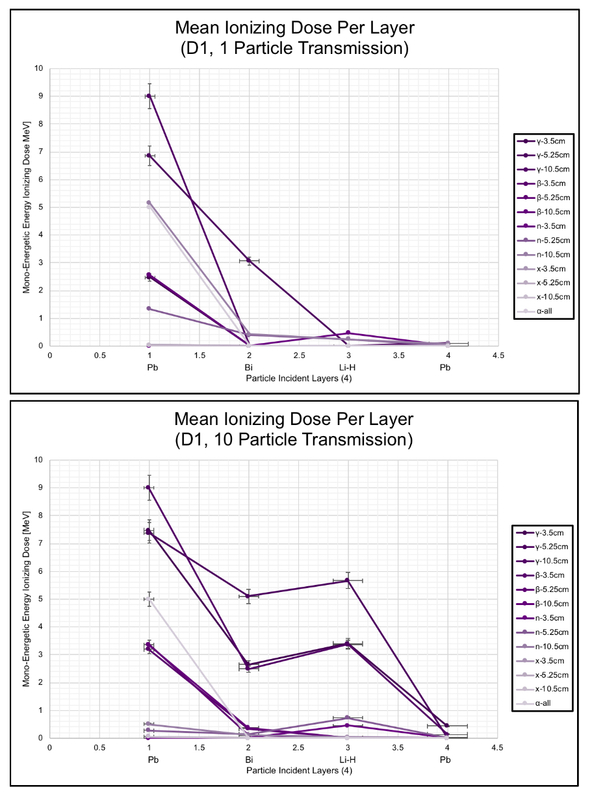 In the two graphs above, the average ionizing dose decreases to close to 99.9 percent of incident particles either being absorbed or backscattered. There was an increase in energy in the third layer, but this was due to the increase in ionization due to neutron exposure. Overall, the models experimented within this combined two-year research study supported my original objectives and engineering goals. To start, continuing from last year, my two-part base isolator, consisting of a laminated rubber bearing and high damping rubber bearing part connected via plastic compression spring shock absorbers, was able to resist over 50% of the inputted gravitational acceleration and achieve shock self-stabilization within the first 0.5 seconds by about 28%. Similarly, against the 1:50 scaled down Tohoku tsunami-earthquake, my model was able to self-stabilize shock, especially at larger (g) accelerations with a peak gravitational acceleration at 1g. Lastly, the model was able to resist all damage externally, including zero water absorption within the base system, and it was concluded that a panel sided conformation was able to better resist the hydrodynamic forces of the impending wave simulations. In regard to radiation testing, I was able to obtain data comparing how the angular distribution of photon waves contributes to the changed behavior of the photon-photon interaction within layered systems. To add, multiple levels of mono-energetic intensity was placed on the five particle types, thus allowing for a varying behavior of the rays within the model. Even with the original projections of the model to obtain at least a 95% energy reduction over the complete layered system or that greater than the SHIELDOSE model, both D1 and D2 (D1 with stainless steel cover) had a combined energy reduction well over 99% from the initial incident particle MeV value. Lastly, this model was able to increase the amplitude of the photon waves through organized deflection throughout the system and subsequently prevented mass photon detection beyond the tested system, thus showing the viability of the model, in total, for a variety of uses, while exposing the lack of viability of the SHIELDOSE model created by the European Space Agency in higher energy photon transmission experiments. Outside of the objectives, there were many instances of my data justifying my original theories. For example, the original hypothesis of the use of lithium-hydride, due to its low atomic number element composition, was able to deflect all neutron intrusion back onto the start of the system. In contrast, there was an increase in MeV in the SHIELDOSE model for neutron emission testing. In addition, SHIELDOSE was unable to stabilize the photon transmission of gamma rays. In sum, both D1 and D2 supported conjectures regarding the usability of the models in comparison to SHIELDOSE, as a cheaper, thinner, and more effective radiation shield. As a combined study, this project sheds light on a solution to the problem of disaster protection for the masses. With this, hopefully we can prevent another catastrophe from costing the lives of thousands such as what happened in Tohoku in 2011 or in Haiti in 2010 or in Indonesia this year. My name is Daniel Noon, and I'm a junior in Arizona. Outside of doing research, one of my main passions is playing and teaching chess. After competitively playing chess for several years, I have seen how much chess has helped me to think critically and strategically, and how chess made me more capable of learning deeply. With this in mind, I wanted to spread chess to underserved schools and organizations serving disabled youth, so I began ChessEd to spread hope to the hopeless. Just like in comprehensively learning chess, I have taken my scientific education inside and outside the classroom as not a list of chores to complete daily, but rather as a quest toward answering questions from how certain natural disasters affect structures to what kind of cheese the moon is made of (just kidding). And through this, I have begun to see how interconnected the scientific world really is, even if that means staying up all night learning about seismology. Lastly, I believe that theoretical physicist Richard Feynman is someone who has taken on self-learning so vigorously since a young age in order to find such connections in physics that led him to ground-breaking discoveries in quantum electrodynamics--something I wish to emualate some day. Though I am sure winning the Google Science Fair would be a dream-come-true for many, for me it is much more than that: it is a confirmation that I have the capability to not only achieve success but also engender change and progress. Boyer, and Timothy H. “Interference Between Source-Free Radiation and Radiation from Sources: Particle-Like Behavior for Classical Radiation.” [1703.06309] Interference Between Source-Free Radiation and Radiation from Sources: Particle-Like Behavior for Classical Radiation, Cornell University Library, 18 Mar. 2017. Childs, P. A, and C.C. C. Leung. “A One‐Dimensional Solution of the Boltzmann Transport Equation Including Electron–Electron Interactions.” AIP.com, Journal of Applied Physics, 1996, aip.scitation.org/doi/abs/10.1063/1.360935?journalCode=jap. Choi, Charles Q. “Space Radiation Too Deadly For Mars Mission.” Space.com, 31 Mar. 2008, www.space.com/5190-space-radiation-deadly-mars-mission.html. Clark, Ashley. “Active Radiation Shielding.” Radiation Shielding Techniques for Human Spaceflight, Stanford University, 17 July 2015. Desobry, G E, and A L Boyer. “Bremsstrahlung Review: an Analysis of the Schiff Spectrum.” PubMed.com, PubMed, 1991. “Ionizing Dose Model Shieldose.” SPENVIS, European Space Agency. “Ionizing Radiation.” Centers for Disease Control and Prevention, Centers for Disease Control and Prevention, 7 Dec. 2015, www.cdc.gov/nceh/radiation/ionizing_radiation.html. Loffredo, Filomena, et al. “Validation of the Electromagnetic Physical Processes with Software SPENVIS.” American Journal of Environmental Protection, Science Publishing Group, 27 Oct. 2015. Maine, Elicia, and Michael F Ashby. “Cost Estimation and the Viability of Metal Foams.” ResearchGate, Apr. 2000. Ray, McGinnis. “Shielding Equations and Buildup Factors Explained.” MIT Software Development. Seltzer, Stephen M. “Updated Calculations for Routine Space-Shielding Radiation Dose Estimates: SHIELDOSE.” NIST, 17 Feb. 2017. “SPENVIS - Space Environment, Effects, and Education System.” SPENVIS - Space Environment, Effects, and Education System, European Space Agency. 1The 10 Most Destructive Tsunamis in History." Australian Geographic. Web. 15 Feb. 2016. 2. "About TCP." About TCP. Web. 15 Feb. 2016. <http://tsunamiportal.nacse.org/pages/portal.force.page.php>. 4. "Building Strong Shapes with Triangles." Building Strong Shapes with Triangles. Web. 15 Feb. 2016. 5. "Cascadia Subduction Zone | Pacific Northwest Seismic Network." Pacific Northwest Seismic Network. Web. 15 Feb. 2016. 6. "Del Norte Triplicate." Del Norte Triplicate. Web. 15 Feb. 2016. <http://www.triplicate.com/Northcoast-Life/Northcoast-Life/Cascadia-Quake-Our-Big-One>. 7. "Earthquake Scenarios." Earthquake Scenarios. Web. 15 Feb. 2016. <http://www.crew.org/products-programs/earthquake-scenarios>. 8. "Guidelines for Design of Structures for Vertical Evacuation from Tsunamis." Guidelines for Design of Structures for Vertical Evacuation from Tsunamis | FEMA.gov. N.p., n.d. Web. 02 Mar. 2017. 9. "The Earthquake That Will Devastate the Pacific Northwest." The New Yorker. Web. 15 Feb. 2016. F. Hydrodynamic Forces. Clarkson University. Web. <http://web2.clarkson.edu/projectsfluidflow/courses/me537/1_2Drag.pdf>. 10. "How Do Base Isolators Work?" Science Learning Hub RSS. Web. 15 Feb. 2016. 11. "How Earthquake-resistant Buildings Work." HowStuffWorks. HowStuffWorks.com, n.d. Web. 15 Feb. 2016. 12. "Illumin - Base Isolation." Illumin - Base Isolation. Web. 15 Feb. 2016. 13. "Japan Earthquake & Tsunami of 2011: Facts and Information." LiveScience. TechMedia Network, Web. 15 Feb. 2016. 14. "Major Update: Catastrophic Failure of Sea Walls in Japan." Daily Kos. Web. 1 Feb. 2016. 15. "Mega-quake: The 'big One' Could Happen Soon, but Probably Not Where You Think." MNN. Web. 15 Feb. 2016. 16. "Municipal Services Building by Baird." CIVIC. 6. Web. 15 Feb. 2016. 17. Oskin, By Becky. "What Is a Subduction Zone?" LiveScience. TechMedia Network, 06 May 2015. Web. 15 Feb. 2016. 18. "Richter Scale." & Magnitude. Web. 15 Feb. 2016. 19. Survival Building. Tsunami Load Determination for On-Shore Structures. Web. <http://www.fzk.uni-hannover.de/fileadmin/institut/Veranstaltungen/DFG-RT/DFG-pdf/1.2.1_-_Yeh__Harry_-_DFGTsunamiForce.pdf>. 20. "Tsunamis." Tsunamis. Web. 15 Feb. 2016. <http://www.ussartf.org/tsunamis.htm>. 21. "What Percentage of the American Population Lives near the Coast?" US Department of Commerce, National Oceanic and Atmospheric Administration. Web. 18 Sept. 2016. 22. "Unlocking the Cascadia Subduction Zone's Secrets: Peering into Recent Research and Findings." Unlocking the Cascadia Subduction Zone's Secrets: Peering into Recent Research and Findings. Web. 15 Feb. 2016. *All research regarding the construction and design of the inventions was done solely by me and without the aid of outside professors. These professors only gave me the usage of their laboratory equipment for testing.